IE has launched its WOW Room, taking its commitment to technology immersion in the learning environment to the next level. The futuristic learning space is the result of a combination of IE’s teaching excellence and latest generation technologies aimed at inspiring the class of the future. With this project, unique in Europe, IE further strengthens its commitment to innovation and breaks with traditional onsite, blended and online education models. The WOW Room transforms the learning experience through elements that include artificial intelligence, simulations in real time, big data analysis, interactive robots, emotion recognition systems, and the presence of experts using holograms. Professors will either be physically present in the WOW Room or will be projected in hologram form and moved around the room by a robot in order to interact with students. In addition to simulations, professors will use artificial intelligence and big data analysis on large screens. They will receive student participation statistics and propose votes on subjects of debate to promote collaboration. All classes will be recorded to enable subsequent access and reviewing of content. The WOW (Window on the World) Room, is a physical space located on IE’s Madrid center with 48 screens that comprise a digital tapestry of 45m2 shaped in the form of a “U” and with up to 200 degree vision. The hardware includes 2 tactile screens and cameras that permit the recording and editing of sessions in real time. In order to coordinate the space, the WOW Room team works with latest generation computers, SyncRTC servers, robots and holographic projectors. With regard to software, the WOW Room benefits from a SyncRTC video collaboration platform customized specifically for the project. The WOW Room provides advanced videocollaboration solutions that require low broadband levels to ensure effective participation of students using any kind of device from anywhere in the world. 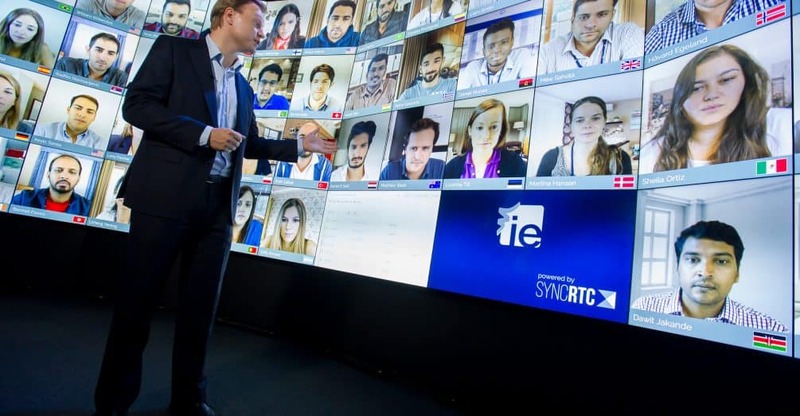 “The WOW Room allows students to connect and collaborate no matter where they are, even if the only way they can join is through their mobile phone at the airport”, says Jolanta Golanowska, Director of Learning Innovation at IE. “We are using a heavily customized version of software from SyncRTC, which allows us to collaborate without any delays and gives the faculty a range of tools to make the class extremely engaging. At the same time, the whole system is user friendly and requires minimal technical support to run”. The WOW Room further consolidates IE’s position as a pioneering institution in Europe in terms of the development of innovative learning models. IE launched its E-learning unit, IE Learning Net, in 2002. Since then, over 3,000 undergraduate and postgraduate students participate each year in online modules as part of theirpresential or blended programs. IE was the first business school in Spain to run MOOCs on Coursera, a world leader in open online education, with 200,000 participants in over 150 countries. Moreover, IE is the No. 1 school in the world in the Financial Times ranking of Online MBAs, having held the position for the last 3 years.